Skeleton crosswords are a rare and tricky variant of the standard crossword puzzle. As such they present one of the toughest crossword-solving challenge that exists! With a skeleton crossword (also sometimes called diagramless crosswords), the grid is literally bare with just a skeleton grid presented, hence the name of the puzzle. The challenge of these puzzles is not just to solve the crossword clues and fill the grid as normal, but to create the very grid itself as you go along. In order to help, a few clue numbers and a few black squares are given at the start of each puzzle, and from there the rest is up to you. 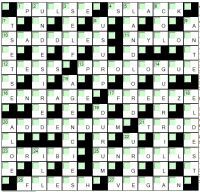 In order to help, each grid exhibits the standard rotational symmetry of crossword grids, which means that you can usually get two pieces of information from what you are provided with. For instance if the second square in the top row is black, then you know by symmetry that the penultimate square in the bottom row is also black in order to preserve the rotational symmetry. Similar logic can be used for when you place an answer letter, you know that it's symmetrical partner must also be a solution square. Using symmetry makes the solving process a lot easier, although it is still tricky - as you will need to battle solving the grid and the clues both at the same time. However because it is such a tricky solve, and can take a while to get going, then there is a particularly strong sense of satisfaction that comes with solving a skeleton crossword. As such we hope that those of you who are unfamiliar with this puzzle type will enjoy it, if not initially, and fans of the puzzle type enjoy the regular skeleton crossword solving challenges that we will present with the puzzles on this site in our online solving area.